H.E.A.T is a band formed in Sweden in the year 2007, after two bands merged; Trading Fate and Dream. The band is signed to Peter Stormares record label StormVox an released their debut album H.E.A.T in 2008. In 2007, they were an opening act to Toto, and the following year they were the opening act to Sabaton and Alice Cooper, as well as performed at the Sweden Rock Festival that year. They were also awarded with the ?rets nykomlingar award, an award given out by the Swedish radio station P4 Dist for the best new artist of the year, as voted by the listeners. The band is signed to Peter Stormares record label StormVox an released their debut album H.E.A.T in 2008. 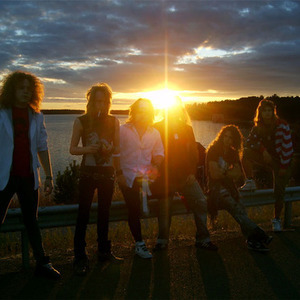 In 2007, they were an opening act to Toto, and the following year they were the opening act to Sabaton and Alice Cooper, as well as performed at the Sweden Rock Festival that year. They were also awarded with the ?rets nykomlingar award, an award given out by the Swedish radio station P4 Dist for the best new artist of the year, as voted by the listeners. In 2009, the band played at the Melodifestivalen 2009, the Swedish qualifier to the annual Eurovision Song Contest, making it to the final round with the song 1000 miles. The band have also toured around Europe as an opening act to Edguy in January 2009. Their second album "Freedom Rock" was released in May 2010. It was ranked in the top 10 AOR/Melodic Rock albums of 2010 by Classic Rock Magazine. Vocalist Kenny Leckremo left the band in summer 2010. The band's new lead vocalist is Erik Gr?nwall.